On Tuesday, Taiwan’s president, Ma Ying-jeou, announced a plan for dialing down tensions in the South China Sea, where Brunei, mainland China, Malaysia, the Philippines, Taiwan, and Vietnam all have overlapping claims to various maritime features. Ma’s South China Sea Peace Initiative calls for shelving the disputes in favor of negotiating resource-sharing agreements. Taiwan is in a unique position when it comes to the South China Sea. As the Republic of China, it inherited all of the ROC’s territorial claims, including the original 1947 “11-dash line” in the South China Sea. In fact, Taiwan occupies the largest natural island in the Spratlys, Itu Aba (known as Taiping Island in Taiwan), where it is engaged in its own construction activities. Taiwan’s government has moved to defend its claims in other ways as well, such as increasing the size of military drills in the region and expanding military surveillance missions to include the South China Sea. In fact, the same day Ma announced the peace initiative, a group of 18 graduate students and two teachers returned from a trip to Itu Aba that was designed to strengthen Taiwan’s territorial claim. At the same time, however, Taiwan has sought to keep some distance between its claims and the mainland’s. Just over a year ago, Taiwan’s Mainland Affairs Council explicitly said that Taipei will not cooperate with Beijing on the South China Sea territorial disputes. Despite this, Taiwanese were targeted in anti-China riots in Vietnam last year after China positioned an oil rig in waters Vietnam claims as part of its exclusive economic zone (EEZ), leading some to call for more efforts to separate Taiwan and China’s positions. Ma’s South China Sea Peace Initiative is the latest effort to distinguish Taiwan’s strategy for handling the disputes from China’s. The new initiative is similar to the East China Sea Peace Initiative announced in August 2012, which also calls for shelving disputes (in that case, the Senkaku/Diaoyu Island dispute with Japan) and sharing resources. The East China Sea Peace Initiative led to the signing of a break-through fisheries agreement between Taiwan and Japan, which would see both Taiwanese and Japanese fishing boats allowed to operate within the 12 nautical miles of territorial sea generates by the Senkaku/Diaoyu Islands. The peace initiative also calls for all parties to respect and adhere to international law and to seek to peacefully resolve their disputes. Notably, Ma’s description of the South China Sea Peace Initiative came at the opening ceremony for a conference focused on international law in the Asia Pacific. 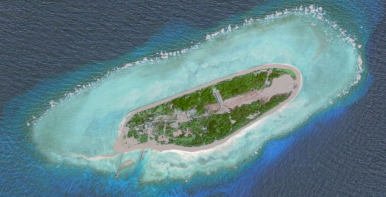 The Philippines, along with its ally the United States, has accused China of violating international law by carrying out large-scale land reclamation activities on dispute features. Ma also called for all the parties involved to uphold freedom of navigation and overflight in the region, an issue repeatedly emphasized by the United States. The response from Beijing was less than enthusiastic. Foreign Ministry spokesperson Hua Chunying said in a press briefing that “Chinese people across the Taiwan Straits are obliged to jointly safeguard national territorial sovereignty and maritime rights and interests, and maintain peace and stability in the South China Sea.” Beijing is leery of the possibility of Taiwan softening its stance on its own, nearly-identical territorial claims, particularly if Taiwan stakes out a position as a responsible stakeholder while the mainland continues to comes under fire for its “assertive” and “aggressive” behavior. The 2012 East China Sea Peace Initiative had little impact until the signing of the Japan-Taiwan fisheries agreement in 2013 provided a concrete diplomatic achievement. Likewise, the South China Sea version will need a practical, tangible deliverable to prove its feasibility. And with Ma slated to leave office in less than a year — and a high probability that Taiwan’s new president will be from the opposition Democratic Progressive Party — the South China Sea Peace Initiative has little time to gain traction. Taiwan's arguments that Itu Aba is, in fact, an island could benefit China in the upcoming arbitration ruling. Diplomatic Access: TaiwanTo Counter Beijing, Japan Moves Closer to TaiwanWhat Does the 1992 Consensus Mean to Citizens in Taiwan?Taiwan Calls for New Cross-Strait Relations After Xi’s Strong SpeechCan a Taiwanese Be The Delegate of China’s 19th Party Congress?